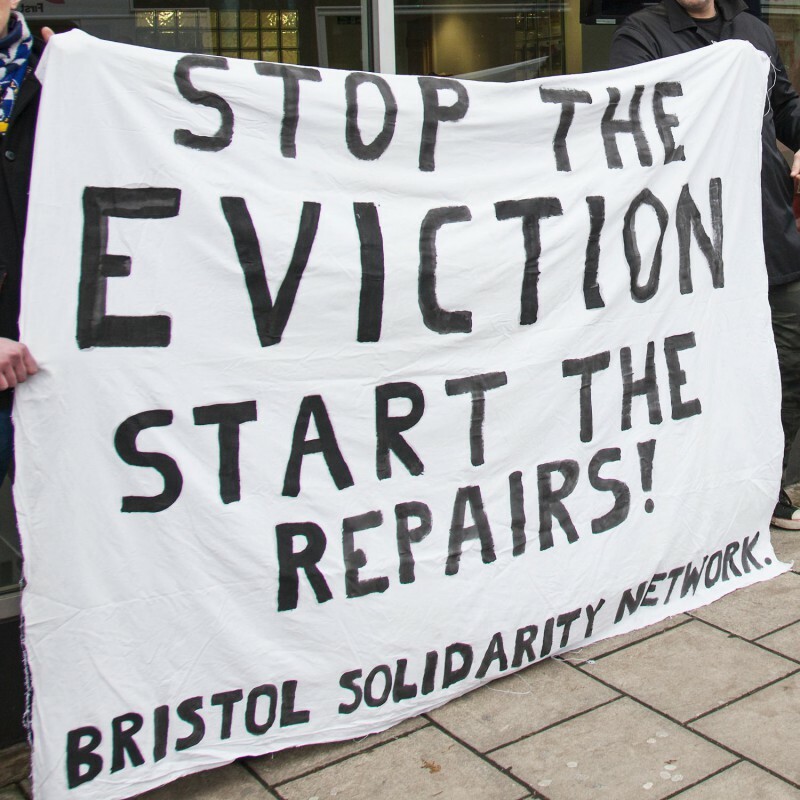 Bristol Solidarity Network | Together we are stronger. Together we can win. Together we are stronger. Together we can win. Come and get in on the action with Bristol Solnet. There’s lots to do and the more of us there is, the more we can do. There’s various ways you can help out and get involved. Resolve, resilience and repairs! Win report! Well, this win has been a long time coming and a lot of solid work has made it a victory we can be very proud of. We are well pleased to announce that all the repairs demanded have been finished for an Easton based family who contacted us in November 2014 after seeing one of our posters. Not only have they won their fight for a decent, liveable home, but they have also secured a legally binding 5 year guaranteed tenancy with no rent increases! Here’s the story of how it happened! The length of the list of urgent repairs we identified with the family was matched only by the length of the cracks in the wall and the time the family had been waiting for the landlord, Mr. Ernie Biela, and his letting agency, Central Estate Agency to fix up the house. Jabar Mohammed of CEA arrogantly and callously ignored and refused all the family’s requests for desperately needed repairs. So, while he and the landlord were getting rich from fees and rent the family members were getting asthma and poor health from living in intolerable cold and damp. Equally culpable in all this was the council, who refused to take any action when their own improvement notice and licencing conditions ordering repairs were flouted by the landlord. Box ticking, sidestepping Lisa Williams from the environmental health dept made it very clear that we would not be getting any help from the council. Our first step was a demand letter delivery to CEA in December 2014. Mr Mohammed responded with a call to the tenants saying they should leave the house and would be evicted if they did not go. So then we demonstrated at their offices on Gloucester Road and went in for a frank discussion with Mr Mohammed. He was visibly squirming at a barrage of awkward questions and home truths from family members and supporters as well the embarrassment of the demo exposing their profiteering negligence, complete with large photos evidencing his “management” of this house of horrors. Passers by stopped to hear about the situation and were very supportive of the family’s fight for a decent home. Shortly after the demo CEA did a quick distancing job and ceased any involvement with the property, finding it all too much and folding at the first sign of pressure. So then it was time to deal with the landlord directly. Mr. Biela is a man that likes the sound of his own voice and likes getting things his way. He tried everything to avoid his responsibilities to do the repairs. He tried to pass it off as an overcrowding issue (“Why can’t they live like normal people?” and “They like living in squalor” – actual direct quotes from him!). He clumsily attempted to sow doubt and division in a phone call to the tenants, claiming that the solidarity network is racist and possibly involved with UKIP! He chose retaliatory eviction over responsible action, issuing a notice to quit to the family shortly after a phone call in which he gave assurances that he would start the repairs soon. As a result, the family suffered a great deal of stress and anxiety facing the threat of being made homeless. A widely publicised communications blockade of Mr. Biela and his businesses followed as we started to increase the pressure on this slum landlord. Alongside our support and actions, the tenants sought the help of South West Law, who gave excellent advice and acted quickly and decisively. They exposed the eviction notice as bogus and invalid and threatened legal action. Getting it from all sides now, Mr. Biela finally, after almost 10 years of ignoring his tenants’ requests for a liveable home, agreed to start the repairs. It was clear that the pressure was getting to him and he realised that fixing the house and fulfilling his responsibilities to the property and his tenants would actually be the cheaper option. The repairs are finished and the family are finally enjoying a home fit to live in. We are proud to have stood alongside this determined and courageous family in their struggle. Their refusal to give up should be an inspiration to us all. Together we have shown that we can fight and win. We wish them all the best for the future. We also look forward to supporting other tenants and winning more victories for decent and safe housing for all. 14 Robertson Road, Easton, Bristol. BS5 6JY. Come and get in on the action with Bristol Solnet. There’s lots to do and the more of us there is, the more we can do. Let’s make 2016 the year of fighting to win! We have now helped not one, but two ex-workers at Cafe Amore secure victory! Bonny & Rhyannan both contacted us separately after having wages withheld by the boss of Cafe Amore. After the first picket, which was held with our friends in the IWW, Amore management paid Bonny the money she was owed. On the day of the second picket Rhyannan was paid in full as well. Never let the bosses make you think you are powerless! 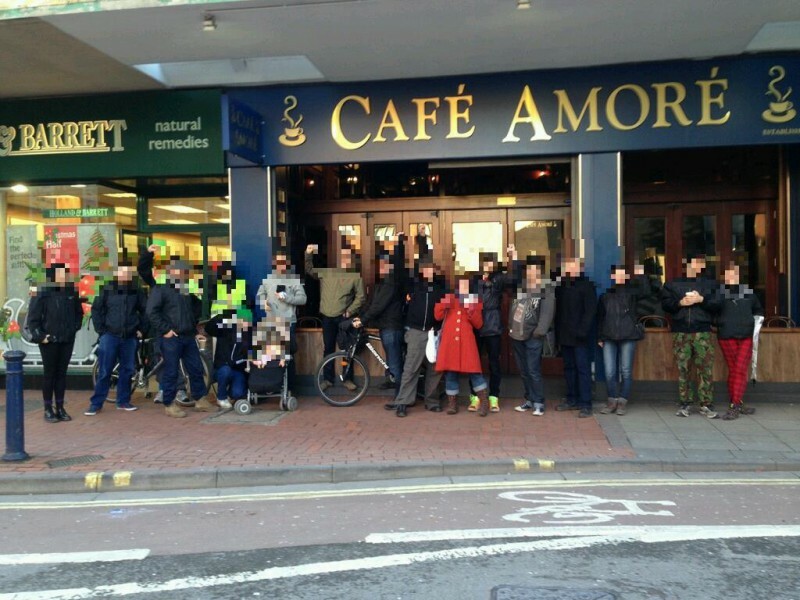 Cafe Amore Update: Picket This Saturday & One Victory! The campaign by Bristol Industrial Workers of the World and ourselves to recover stolen wages from the manager of Cafe Amore has already started to pay off! Following our picket, and a large number of people starting to boycott the Cafe, the wages for one of the workers, Bonny, have now been paid in full. However, Rhyannan who recieved no pay despite working for eight shifts, has yet to get a penny! We will be holding a picket outside the Cafe from 12noon this Saturday (21st of Nov), to demand payment of her wages. We encourage anyone who wants to stand up for workers to join us. As with the last picket we will be friendly and light hearted – leafleting, chanting, singing and talking to any potential customers or passers by. We are aware of other instances of wage theft and poor treatment of staff in central Bristol, if you are affected get in touch with us or the IWW. If you use Facebook please share the event! 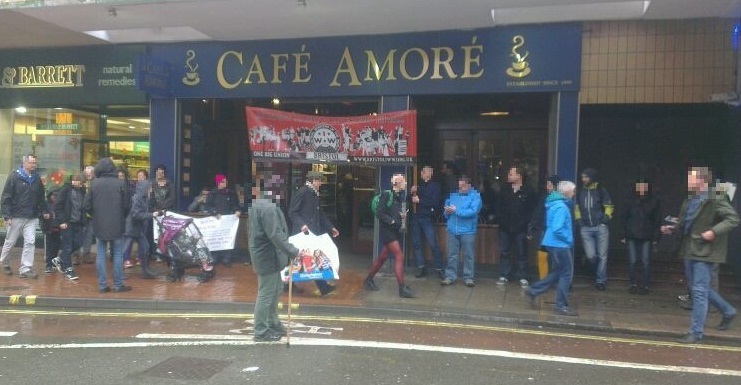 Today former workers at Cafe Amore in Bristol joined forces with the Industrial Workers of the World (IWW) and Bristol Solidarity Network (SolNet) to confront their wage stealing boss. Demo this Saturday! 12 noon. Cafe Amore, 3 Nelson St, Bristol BS1 2DS. Bristol Solidarity Network is joining forces with Bristol IWW to put the pressure on Cafe Amore management to pay stolen wages. We will be campaigning together to expose the greedy management and their mistreatment of employees and make sure workers are paid what they are owed. Bullying boss Goodarz Kiadeh has a reputation for exploiting workers and refusing to pay wages owed. Nobody likes a boss who steals workers’ wages. We won’t stop until this boss pays up! Join the demonstration and stand together with Cafe Amore workers. Solidarity gets the goods! Get involved in Bristol Solnet! Now’s a good time to join the network! We have regular meetings every 2nd and 4th Tuesday of the month. We meet 7.30pm at Kebele Social Centre, 14 Robertson Road, Easton. BS5 6JY. Faced with relentless attacks on our quality of life from bosses, landlords, authorities and politicians, it is easy to give up the fight, keep our heads down, and accept that this is just the way things are. Bristol Solidarity Network is determined to show another way, based on principles of solidarity and shared struggle. We are a group of local people committed to sticking together to overcome common problems we face. We can make real changes for the better through concerted, collective effort and direct action. Since starting out in 2013 we have successfully accompanied workers and tenants to win their struggles against profiteering, bullying bosses and landlords. From putting a stop to management harassment and families being forced into homelessness to forcing bosses to pay stolen wages and a slum landlord to do the repairs, we have chalked up some solid victories. We have clearly seen the strength of working together to pile on the pressure. Solidarity is our best defence and direct action gets results! 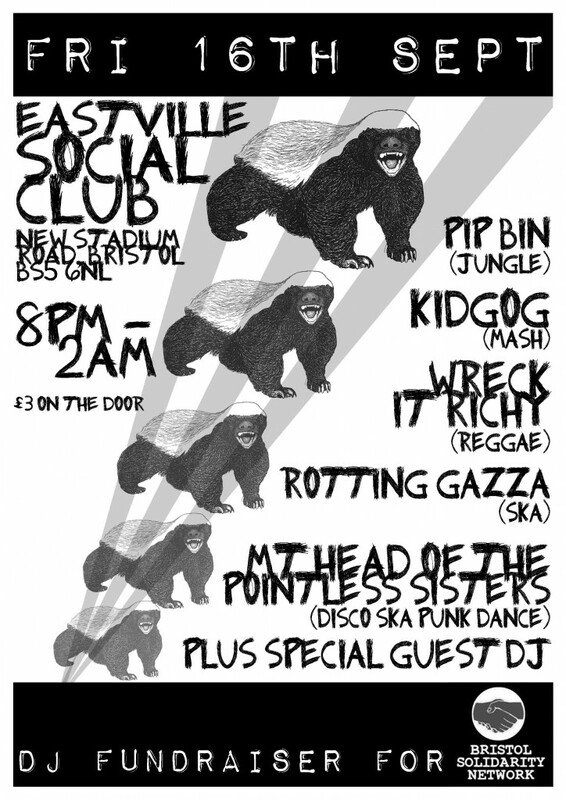 If you share our ideas of getting organised to get used to winning, get in touch! We have regular meetings that are open to all who share our ideas and aims. We want to make sure that the solidarity network is open, accessible and welcoming. We have strength in numbers and as the network grows, so will our ability to win more victories!